American statesman, born at Feeding Hills, near Springfield, Massachusetts, on the 27th of October 1800, of Puritan ancestry. He was reared on a farm, receiving little systematic education, and in 1821 he removed with his family to Andover, in the Western Reserve of Ohio. Here he spent two more years on a farm, and then, securing employment as a drover, worked his way to Philadelphia and finally to Albany, New York, where for two years he taught school, studied medicine, and was a laborer on the Erie Canal. Returning to Ohio in 1825, he studied law at Canfield, was admitted to the bar in 1827, and began practice at Jefferson, Ashtabula county, where from 1831 to 1837 he was a law partner of Joshua R. Giddings, the anti-slavery leader. During 1837-39 and 1841-43 he was a Whig member of the Ohio State Senate. From 1847 until 1851 he was a state district judge, and from 1851 until 1869 was a member of the United States Senate, first as an anti-slavery Whig and later as a Republican. In the Senate Wade was from the first an uncompromising opponent of slavery, his bitter denunciations of that institution and of the slaveholders receiving added force from his rugged honesty and sincerity. His blunt, direct style of oratory and his somewhat rough manners were characteristic. After the outbreak of the Civil War he was one of the most vigorous critics of the Lincoln administration, whose Ohio member, Salmon P. Chase, had long been a political rival. He advocated the immediate emancipation and arming of the slaves, the execution of prominent Southern leaders, and the wholesale confiscation of Confederate property. 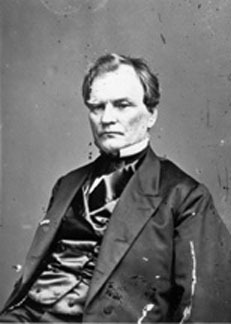 During 1861-62 he was chairman of the important joint committee on the conduct of the war, and in 1862, as chairman of the Senate Committee on Territories, was instrumental in abolishing slavery in the Federal Territories. In 1864, with H. W. Davis, he secured the passage of the Wade-Davis Bill (for the reconstruction of the Southern States), the fundamental principle of which was that reconstruction was a legislative, not an executive, problem. This bill was passed by both houses of Congress, just before their adjournment, but President Lincoln withheld his signature, and on the 8th of July issued a proclamation explaining his course and defining his position. Soon afterward (August 5) Wade and Davis published in the New York Tribune the famous "Wade-Davis Manifesto", a vituperative document impugning the President's honesty of purpose and attacking his leadership. As long as President Andrew Johnson promised severe treatment of the conquered South, Wade supported him, but when the President definitively adopted the more lenient policy of his predecessor, Wade became one of his most bitter and uncompromising opponents. In 1867 he was elected president pro tem of the Senate, thus becoming acting vice-president. He voted for Johnson's conviction on his trial for impeachment, and for this was severely criticized, since, in the event of conviction, he would have become president; but Wade's whole course before and after the trial would seem to belie the charge that he was actuated by any such motive. After leaving the Senate he resumed his law practice, becoming attorney for the Northern Pacific railway, and in 1871 he was a member of President Ulysses S. Grant's Santo Domingo Commission. He died at Jefferson, Ohio, on the 2nd of March 1878. His son, James Franklin Wade, was colonel of the 6th United States (colored) cavalry during the Civil War, and attained the rank of major-general in the regular army in 1903, commanding the army in the Philippines in 1903-04.